If you have never eaten homemade taquitos, you are truly missing out. The crunch from the fried tortilla encasing tender chicken is a dynamite combination. This recipe keeps the chicken filling pretty simple but feel free to spice things up by mixing the shredded chicken with flavorful sauces like green salsa, barbecue sauce, buffalo sauce, or even red enchilada sauce. 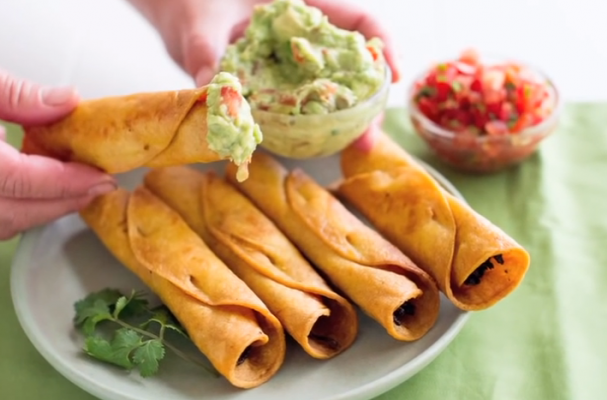 Also, if you are looking for a healthier version of this recipe, bake the taquitos instead of frying them. To do this, lay the taquitos on a baking tray and spray them with olive oil spray and bake them at 425 degrees Fahrenheit for 15 to 20 minutes.